Peace chrome bedroom wall light with a separate LED reading light. 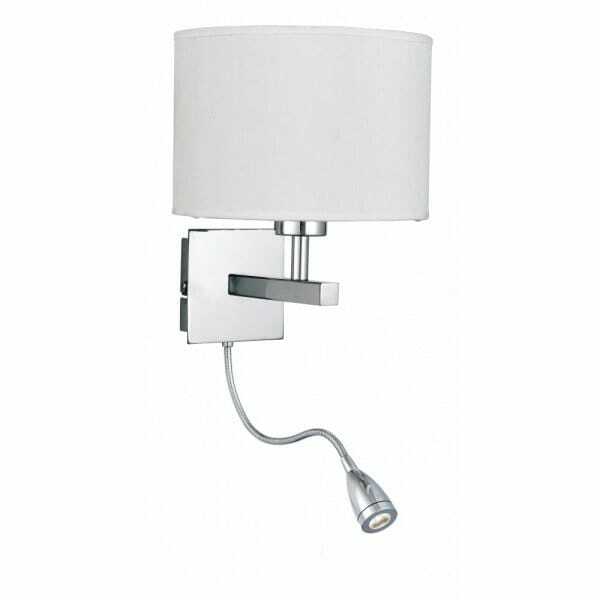 A stylish practical reading wall light for using in bedrooms at home or as hotel bedroom lights. Switched separately allowing you to control the level of light. The standard wall light can accommodate a low energy bulb and is supplied complete with the circular white fabric shade illustrated. The led book light has an integrated LED bulb that provides a narrow concentrated beam of light that allows you to read comfortably in bed without disturbing a partner who wants to sleep. By using a low energy bulb in the wall light, combined with the LED light in the flexible reading arm, this is a very low energy wall light with minimal running costs.